It’s not hard to understand why Sir Francis Drake bought Buckland Abbey as his home after liberating the Spanish of a haul of booty. This Tudor renovation project is located on the edge of beautiful Dartmoor in Devon, not far from Drake’s birthplace of Tavistock, and within easy reach of Plymouth. It was from where he embarked on many of his expeditions in the name of Queen Elizabeth I. To the English Drake was a hero, circumnavigating the globe and bringing home great treasures. To the Spanish he was a pirate, El Draque, with a bounty on his head. Either way, he has a firm place in the nation’s seafaring history. This is reflected in his former home, which stayed in his family until a major fire in 1938. It was sold and then handed over to the National Trust ten years later. We had the opportunity to visit Buckland Abbey while staying at the Moorland Garden Hotel just a few minutes down the road. We arrived in the wake of Storm Brian, wondering if we were going to get a drenching from the ominous clouds above. Thankfully the skies cleared and we were able to explore with the wind at our backs to spur us on. As its name suggests, this historic Devonian residence was once a monastery. King Henry VIII was responsible for its demise and handed it over to one of his favoured noblemen. Over the centuries it was adapted into a home. But hints of its former purpose remain, such as the outlines of vaulted ceilings on the external walls. During our visit, Buckland Abbey was hosting a special exhibition by artist Andrew Logan. Pieces ranged from sculptures you could hold in the palm of your hand to an enormous installation of golden wheat and glass butterflies which filled the Great Barn. Each work of art had been made using broken mirrors and ‘urban flotsam’ like discarded metal and costume jewellery. At times the sculptures seemed at odds with the former monastery. And at others it all seemed to make sense. Logan has curated the collection – one of the largest exhibitions to be staged in a National Trust property – to be in keeping with the spirit of the house. In the Treasure room in particular it was easy to mistake Andrew Logan’s art for jewels that once weighed down Drake’s ship, the Golden Hind. The exhibition continues until the start of February 2018. For the latest events, opening times and admissions prices for Buckland Abbey see the National Trust websiteNational Trust website. 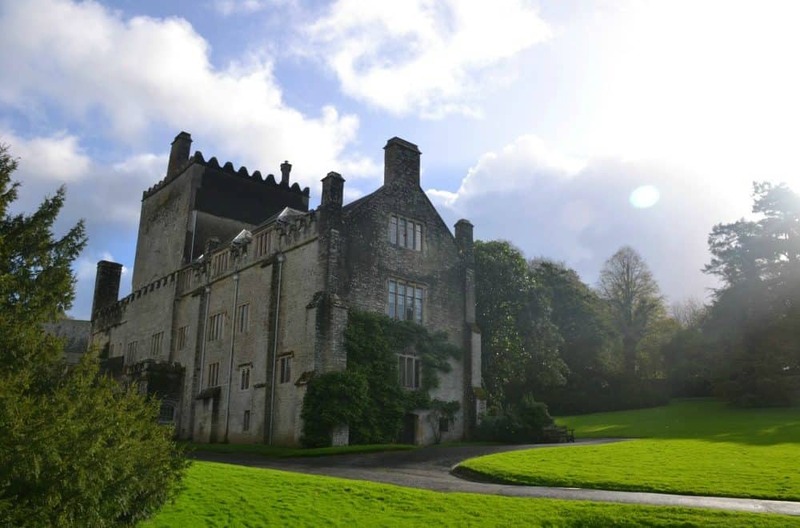 Have you visited Buckland Abbey with kids? What did you enjoy most? We are National Trust members and have been to lots of properties in the Devon and Cornwall area. Check out our days out at Killerton, Saltram House, Lanhydrock, and Trelissick. It was very windy but definitely a good place to visit to escape the elements!